It’s been a long time since I mentioned any progress on the various public art projects Adam Zombory Moldovan of ZMMA Architects and I have been working on. That’s not because there has been no progress, far from it. 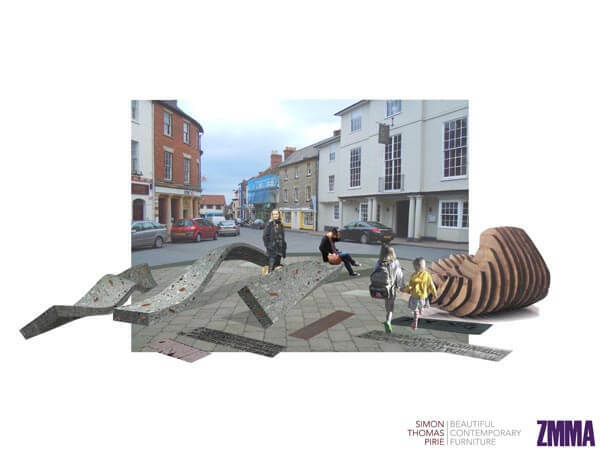 We have now completed the model and visuals for the Common Places project in the middle of town which was recently unveiled by Shaftesbury Civic Society to coincide with the launch of Adam’s new Shaftesbury office. We also wanted it to be on display during Dorset Art Weeks. The High Street facing studio/gallery is a venue during the event, it should mean lots of people get to see it and comment. As well as that Common Places work, Adam is showing recent architectural projects and displaying a selected show of artists from North Dorset. There is also a set of our Torii Tables on display, as well as the stunning pippy oak pivot-hinge door and elm table we made for Adam as permanent features of the space. 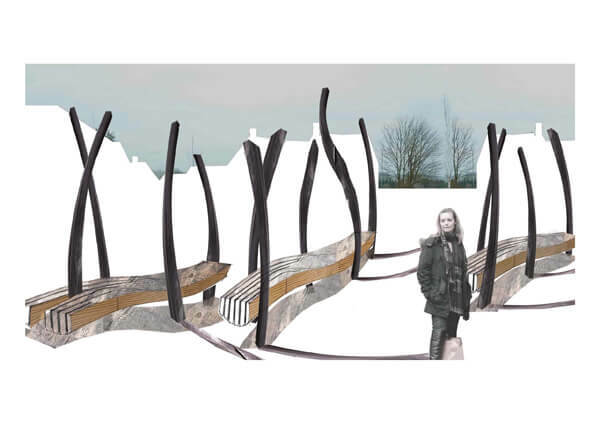 What we are proposing for the Commons artwork comprises of various elements including twisted cast greenstone planks which form seats and surfaces to sit, stand, perform and work on. The other major form is a sliced ‘pebble’ made of slabs of timber from local estates, reflecting the towns market status and relationship with the surrounding landscape. At ground level stone text panels made of different local stones will act as directional signage from the Commons and also tell ‘Shaftesbury tales’; those stories about characters and places in the town that would not make the guide books, but somehow tell you more about the rich culture of a place. The other public art site(s) are on the Persimmon Homes development at East Shaftesbury. The two projects are entirely seperate in terms of funding but linked by ideas, research and a broad desire to integrate this significant new development and its new ‘settlers’ to the existing town and population. How do you make those new residents truly connect to the town, its shops and people, and not just jump in their car to shop in the larger towns around it? A public art trail can’t tackle these big issues by itself, but making those visual connections can help to create links and a cohesive vision for a small market town like Shaftesbury. So far we have had proposals and costings accepted for the 1st East Shaftesbury Persimmon site called The Rickyard. Actual work and installation looks like it will be in early in 2013. We are now looking at a much larger second site called Mampitts Square, effectively the centre new town square with shops, parking, bus stops and public seating. There are footpaths that connect these sites to the old town and further to the surrounding landscape. These ‘routes’ give us the opportunity to repeat themes, helping to create walking, art and tourist trails with the distinctive character that old and new Shaftesbury deserves. 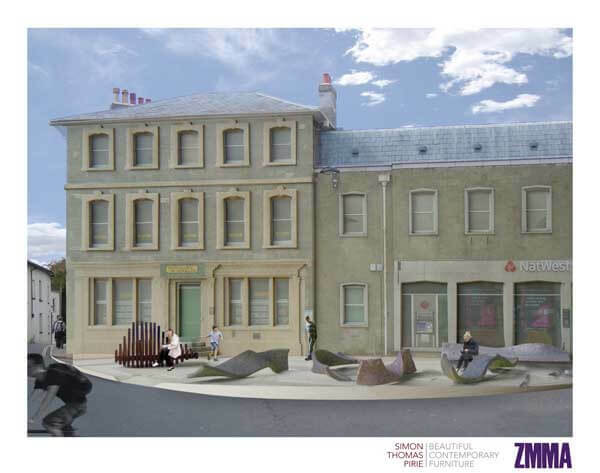 The Common Places scale model is now on display at the new ZMMA studio and gallery at 54a High Street, Shaftesbury.